Risk is amplified for businesses entering their first export market. While there are significant opportunities available to businesses looking internationally – enormous marketplaces, reduced trade barriers, etc. – there are also considerable risks involved in the process. In this post, we’ll review some key strategies for mitigating export risk. Prior to exporting, companies should critically evaluate the opportunity from as many angles as reasonably possible. As a Canadian business, it’s easy to look at the U.S. market and see it simply as one that is 10 times the size of the Canadian market with relatively similar cultural norms; however, it’s likely that you won’t be able to sell your product/service exactly the same way as you do in your home market, and that you won’t be able to exploit your existing sales/distribution channels in the same way. While barriers to trade have been significantly reduced through trade agreements, there are still significant logistical considerations to make when selling across borders. Is there a real demand for our product/service? Are there competing products in this market? How does ours stack up against it? Does our product need to be certified for the new market? How will we sell/distribute? Do we need to engage export/import partners (e.g. export consultants, export houses, local distributors, sales agents, etc.)? How will we service product features? What are the requirements for warranty and product support coverage? At this stage you do not need definite answers for each of these questions, but it’s helpful to have a plan or an idea of how to address the challenges that may arise. If at any point a challenge seems insurmountable, this should act as a signal to reconsider your overall readiness. Exporting is challenging; the purpose of this exercise is to determine if the potential value outweighs the challenges. What does the sales cycle look like in the new market? How is pricing impacted in the new market? Is foreign currency exchange (FOREX) a major challenge? What do the overall margins look like? Does packaging/positioning/etc. need to be changed for the new market and if so, how much will that cost? Running scenarios and analyzing your pilot against these types of factors will inform the wider export launch. By limiting your initial run into the market, you can incur smaller costs while gaining valuable insight into your potential sales base. At the end of a pilot you should have a relatively clear idea of the costs associated with a wider export launch, expected return on investment (ROI) and rate of return, impact to internal processes, product change requirements, and a number of other critical criteria. As is likely clear by now, any company evaluating a new market should engage in significant planning, and every company looking at getting into a new market should develop an export market plan. Even when a company has significant experience in export markets, there’s good reason to use an export market plan. An export market plan can, and should, be used as an early-stage research and analysis tool. Businesses need to comprehensively evaluate whether a new market has the potential to yield positive results. While profitable sales should be the aim of most export projects, sales potential should only be one of the metrics considered in the analysis. Will it result in lost domestic opportunities? Does the company have the existing capacity and capabilities to take on the new market? Is the product/service ready for exporting? Beyond these questions, companies should also conduct research to ensure they understand the market: who are the key players? Are their cultural norms that need to be considered? Are there similar product offerings in that space? Whether developed internally or through a third-party consultant, this aspect of the export market plan is a relatively inexpensive way to analyze the opportunity and systematically review export potential against established criteria. From here, businesses can determine if engaging in export activities will work for them. While some may not consider exporting to be a project – it is (ideally) an on-going activity with no determined end – there are projects that can be carved out throughout the process. The level of detail and complexity in any given exporting project will vary, but in many cases, we find that using the export plan as a project guiding tool helps ensure alignment across internal and external stakeholders. Further, by establishing expected outcomes of the project (which can be as simple as sales/revenue impacts, or as granulated as is appropriate), management and the project team can use objective criteria to evaluate exporting and at which point to pivot direction. This helps ensure the export plan remains a living document and is used throughout. At the end of a project, you can use it as part of a debrief and to help build out more established processes. What processes will need to be changed internally. While there is a cost associated with engaging an export consultant, the feedback and insight gained this way can set you up for greater success once you’re ready to launch the new market. Regardless of your specific need, an export market plan should act as a critical tool to help manage efforts in the new market. In some cases, the market plan is a short document that can be used by senior management to align stakeholders. In others, it’s a series of documents and tools used to manage the entire export process. Through a range of incentive programs, companies can secure government grants to reduce the risk of entering a new market. The CanExport program can help alleviate some of the risks associated with getting into a new market by supporting key costs. Companies can receive grants to help cover the cost of engaging a consultant to complete an export market plan or competitive analysis, exhibit at tradeshows, travel, legal services and other export market-related costs. 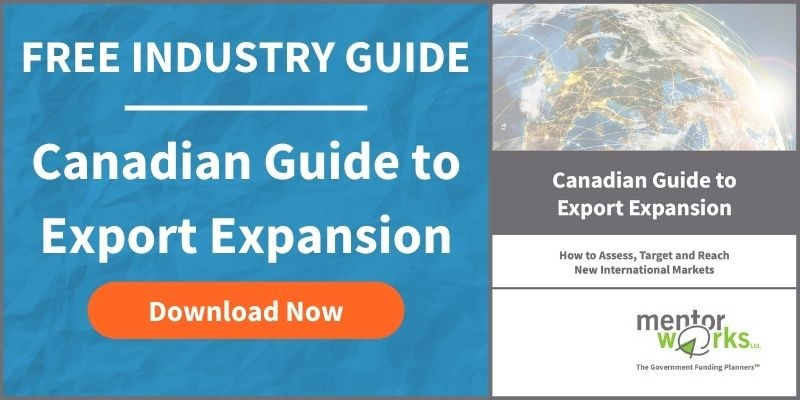 To learn more about export-related consultants, support networks, and resources to reduce the hurdles of exporting, please download the Canadian Guide to Export Expansion.